My journey in Photography began when I was hardly 17 years of age in 1965. My mother gave me my first camera, a Gevabox from Agfa-Gevert. With that I started in the hobby of photography. In those days of film based photography the work involved was really troublesome. The film, printing paper, the exposure in the camera and also in the darkroom had to work with precision to get good photographs. I had bought an Agfa enlarger and experimented various genres of photography in the make-shift darkroom in my home at Belgaum and later on in Kolhapur and Sangli. I read extensively about photography and experimented all the time. Veteran Raghu Rai, was my inspiration. Though I never met him but I followed his art of photography closely and in my formative years he was my inspiration. Photography had been my passion all these years. When I came to Sangli in 1989, I came to know that there was a photography group of photo enthusiasts, named Pratibimb. I joined it in 1998. I got my first SLR way back in 2001, since then I have owned Canon and Nikon SLRS and later on DSLRs. Soon in Pratibimb, I began teaching photography to new entrants. I was mentor to many youngsters and have been teaching photography exclusively since 2008. It was my dream to set-up a photography institute here in Sangli. The dream turned into reality in 2013, when in association with The Sun Art Studio, Sangli I set up a properly named photography Institute, Perfect Pixels. 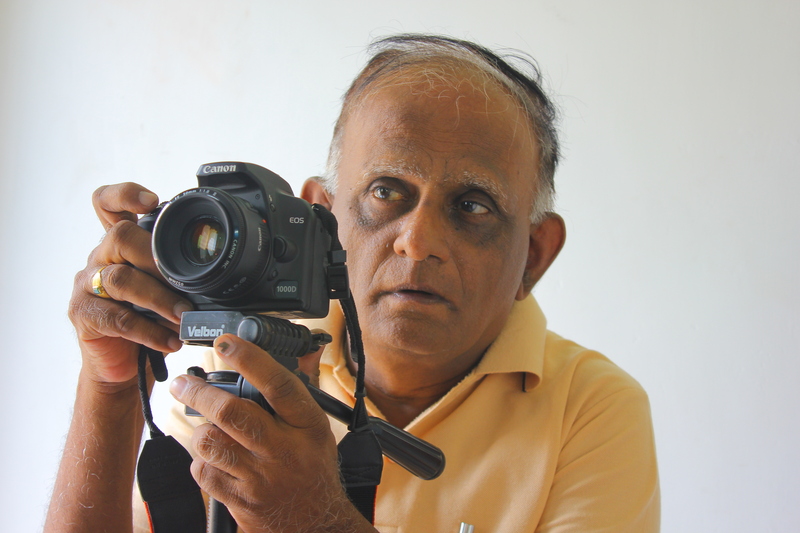 Through this institute I have trained well over 125 photo enthusiasts in and around Sangli. Partly because of my background as visiting faculty at local colleges, I had lot of teaching experience. This helped me establish my photography institute quickly. I use all modern methods of teaching. The equipment I use while teaching includes computers, LED Screens, Epson LCD Projectors, Big Display Screens, lots of old cameras for explaining the intricacies of the cameras etc.I own different types of cameras and have all kinds of accessories needed in photography. The class room where I hold the classes is owned by me. I have sitting arrangement for 15 trainees in one batch, but I admit only 8 for better interaction during the course. At present we conduct two types of photography courses. One is week long course with photo-walk on the last day. The other one, is a week-end course specifically meant for very busy people like Chartered Accountants, Doctors, Lawyers, Businessmen and for all those who are in service . I have trained people from all age groups, literally from 16 to 60 years of Age. Besides the training outlet, I also deliver lectures in Photography at local colleges. Some of them invite me to inaugurate their photo exhibitions and also for judging the photography contests. We have also conducted short introductory photography courses for Popular Marathi Daily, Sakal, through their women’s wing named Madhurangan. Last time we encouraged them to set up a separate women’s group for photography, named Pratibimb Ladies in this group myself along with one of my colleagues, I guide the ladies in improving their photography skills as a mentor. Being the only photography Institute in and around for the photo-enthusiast and amateurs who would like to hone their skills, we constantly receive enquiries from different groups of people. Recently a group of doctors approached us for holding a short introductory course for them. Some schools would like to introduce their students to the hobby of photography. Sangli-Miraj is a medical and educational hub and the opportunities for photography courses is huge. With this latent demand still untapped we are venturing into group activities that encourage photography. This is a sort of win-win situation for our courses as well as for the sale of camera equipment and its accessories. We can tap into hitherto untapped potential for photography. I have been looking after Pratibimb as its secretary since 2005, and has turned the club into a well known entity in photography. After Pune, no other city in southern Maharashtra or Northern Karnataka has such a club dedicated to serious photography. In 2oo6, Pratibimb was put on Flickr by me and one of my friends. This group on Flickr is so popular that it is one of the largest photography communities on Flickr from India , with well over 1150 members from all over the world, and around 15000 photographs in its pool at any given time. I am administrating the group for last 8 years with my friends, Tilak Haria from Mumbai and Miss Conchi Deza from Spain. Besides all these activities, we regularly hold photo exhibitions in Sangli. With the aim of making photography a household hobby, we also help others hold photo-exhibitions and encourage various groups to hold photo competitions. Pratibimb is the main participant in Kirloskar Vasundhara Film Festival every year, where around 150 best photographs depicting flora, fauna, wild-life, socially relevant issues like pollution etc. Last year we received the Vasundhara Mitra Award for our work in this area. Just few days back, Pratibimb, opened its web-site at www.pratibimbsangli.org and has started issuing a e-magazine called Reflections. I am the editor and mentor of these projects. A premier issue of this e-magazine is available for free download from our web-site. I have plans for making this e-magazine a well known source for news ,views and techniques in photography world. Besides teaching photography techniques, I also conduct course in photo editing. Joined Bank Of Baroda in 1970 and retired as Branch Manager in 2001 under VRS Scheme.During the career spanning more than three decades won awards for best performance on national level. While in service in 1986 I joined Walchand College Of Engineering for Computer Programming and System Analysis course of Shivaji University. I stood First in the merit list of that course. being interested in technology based hobbies since college days, I set up Amateur Radio ( HAM ) clubs in Belgaum, Kolhapur and later on in Sangli and popularized this hobby amongst the youngsters in this part of India, by writing articles in technology magazines. Since 1973 I have been proudly holding the Ham-Radio Call-sign VU2NSD. As I was interested in journalism from my college days, I have been writing articles for various publications in English and Marathi newspapers. In fact since 1980 I have written columns in Sakal, Lokmat, on subjects ranging from Science and technology to sports. My series on computers and television, cyber-crime received rave response from all over. On social service front, I have set up a school for deaf and dumb at Sangli in 1991. This is one of the best managed schools for physically challenged. At present I am the chairman of the school. I am also the chairman of executive committee of Mahatma Gandhi Granthalay, a public library, whose corner stone was laid by none other than Mahatma Gandhi himself in 1920. Next year the Library will be celebrating centenary.I have my own NGO Avani Foundation, which works for water conservation and Rain water harvesting and also in eradication of plastic carry bags. I have delivered lectures on various subjects in different organizations like, Rotary, Lions and Giants. I have also delivered lectures on FM Radio and All India Radio on variety of subjects. I have been interviewed Many times on FM Radio and Cable TV for my work in all these fields. I have my own library of well over 1500 books on various subjects including photography. One addition to Dilip Nerlikar’s portfolio: Leading the Eco-friendly Ganesh Idols Project. Making Ganesh idols from paper mesh to avoid harmful effects caused by immersion of Plaster of Paris idols into rivers. Mandar, so nice of you ! Thanks a lot for your kind words ! hi dilip, I am uday kulkarni from BOB now working at BCC Mumbai. very nice to see ur website.